A Marbled Cake is a cake with a mottled appearance, that is the cake is given a streaked, marblelike appearance by mixing of dark chocolate and light batters. You can serve it plain, with a glaze on top or as I did with some toasted nuts. If you are intimidated to make a cake from scratch, this is the perfect cake for you as you can mix the batter with a wooden spoon, a hand-held electric mixer or by using the pulse action of a food processor. Simply place all the ingredients in a bowl and beat until combined. It’s infinitely variable and incredibly easy to make. Yesterday, the Greek food bloggers were invited to a tour at Unilever-Elais factory, this time to see how margarine is prepared. We visited their olive oil factory a few weeks ago and although I am a vivid fan of olive oil, I also use margarine as well, whenever necessary. Butter may taste better and I do use it in a few recipes but it is my choice to make healthier recipes so wherever I can substitute butter or margarine, I use olive oil and where butter is used, I usually substitute it with margarine, which does not contain saturated fat in comparison to butter, which is not good for people having high cholesterol. Before the presentation we were offered tea and snacks, such as sandwiches, spanakopita (phyllo made with becel proactive margarine), cakes, biscuits etc. In most of my recipes I have been using becel proactive which is enhanced with natural plant sterols but all this time I was not sure if by cooking, it looses its properties. However, yesterday all our questions were answered and the answer is that it does retain its original properties, so long as you follow the rules and know how much to eat, which I think should be 3 tsps a day. After tea, the staff welcomed us and we had a presentation of the history of margarine. Their first product Vitam (which takes its name from the vitamins it contains) was first made in 1947. In 1950 their researchers were already working on plant sterols but it took 4 decades until it was finally perfected. In 1993 Omega 3 and Omega 6 essential fatty acids are added to their margarine named Becel and in 2000 Becel pro-active is produced, which is the first margarine which lowers cholesterol. They explained that all their margarines are non-hydrogenated. We took a tour to the factory, however, we were not allowed to take some photos inside. All the hygiene rules were taken, so we had to wear a hat and a robe and passed from various stages of washing hands, shoes etc., and we were informed about all the process regarding the production of margarine. We even tasted the soft margarine a few seconds after it was packed and it was delicious, like eating mayonnaise. When we returned back, Chef Vassilis Mandros made margarine in front of our eyes, using vegetable oils, water, salt, vitamin A (for colour) and lecithin. Although I took a video of the whole process, there was a lot of talking going on, so I just uploaded the one showing the final result. In a cold bain Mari put a bowl and and all the ingredients except the water and mix to combine. Add the water gradually mixing with a hand mixer until it is thick. All the ingredients should be whisked with a hand mixer over a cold bain marie until it thickens. We had a wonderful time with old friends and meeting other food bloggers. When we left again Elais offered us a variety of their margarines, packed in a cooler, a Cookbook with Tea Party ideas and a silicone brush. I was already planning to make a cake, as my daughter had asked me to make a marbled cake a few days ago, which I haven’t made in a long time and last night, when I made it I used Vitam. 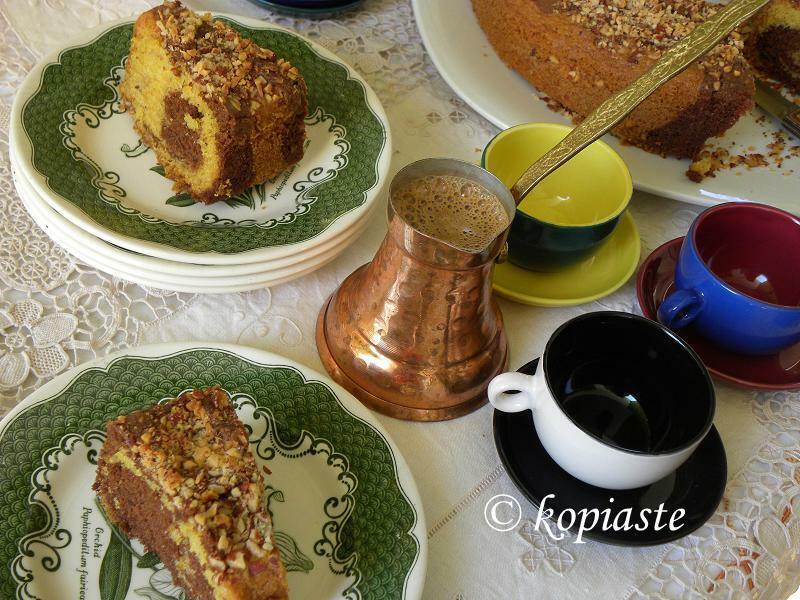 My mother used to make this cake in Cyprus, where it is called Georgraphy Cake from the patterns made in the cake. I have been making this cake since then and instead of using cocoa which my mother did, this time I used couverture chocolate, bergamot zest, which I have kept in my deep freezer and almonds. I used a 28 cm bundt form, as I do not have a smaller one, but a 24 – 26 cm one will make the cake a lot more higher. I wanted the almonds on top, so I carefully inverted the cake in one hand and then put it back in a platter. If you don’t add almonds, you can invert it directly on a platter and sprinkle some icing sugar on top, if you like. The cake is delicious and moist but most of all healthier and believe me, you won’t miss the butter. Using margarine, rather than butter, works really well for this cake and saves you the bother and time of having to soften the butter before you start. Don’t be tempted to open the oven before 40 minutes – you’ll regret it as the cake may collapse! The cake stays fresh upto two days but if you store it in an airtight container (if there is any left! ), it will last for more. Heat the oven to 180C/ 350 F and place the rack in the centre of the oven. Grease a 26cm cake bundt cake form and dust it with flour. In a double boiler melt the chocolate and set aside over the double boiler. In a food processor coarsely chop the almonds and set aside. In the bowl of your electric mixer beat the butter with sugar until light and fluffy. Add the eggs, one at a time, until incorporated. Add the milk and zest and mix. Scrape the sides of the mixer bowl, whenever needed. The batter may look curdled but don’t worry. Sift the flour, corn flour, salt, baking powder, baking soda and vanilla powder. Lower mixer speed and gradually add the flour mixture. Add half the mixture in the baking tin. Gradually add the chocolate (which should not be too hot) in the remaining mixture and mix to combine. Add it on top of the other mixture and with your spatula lightly swirl it around the mixture in the tin a few times to create a marbled effect. Add the almonds on top. Bake the cake for 50 – 55 minutes. After the 45 minutes check with a toothpick inserted into the centre until it comes out clean. Turn out onto a cooling rack and leave to cool before removing from the baking tin. In the bowl of your electric mixer beat the butter with sugar until light and fluffy. Add the eggs, one at a time, until incorporated. Add the milk and zest and mix. Scrape the sides of the mixer bowl, whenever needed. The batter may look curdled but don't worry. Bake the cake for 45 - 55 minutes. After the 45 minutes check with a toothpick inserted into the centre until it comes out clean. Pin the image below to save this perfect marbled cake recipe for later! Δεν ήξερα ότι υπάρχουν και τέτοια events για τους bloggers στην Ελλάδα…!!! Πραγματικά το κέικ γεωγραφίας είναι τέλειο με ένα φλυντζάνι καφέ ή τσάϊ.